Four years in the making, the shining master work that is At The Edge Of Time proves yet again how Blind Guardian’s faith in their craft never wavers or falters. 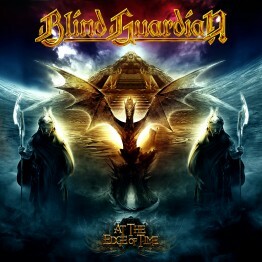 The focus on Blind Guardian’s signature multi-track orchestral compositions (which do not need any synthetic enhancements) has remained intact and combines song writing excellence, distinct character, and the highest collaboration & levels of musicianship into one. The opening hymn and emotional chorus of “Sacred Worlds”, the regal vocals in “Tanelorn (Into The Void)”, the melancholy construction and huge choirs in “Road of No Release,” the 210 bpm of the hyperfast “Ride Into Obsession,” the beautiful string and flute arrangements in the folk-flaired “Curse My Name,” the anthemic thrust of “Valkyries,” the majestic elements of “Control the Divine,” the somber piano sequences and message in “War of the Thrones,” the velocity that drives “A Voice in the Dark,” and the multi-instrumentations in “Wheel of Time” all find perfect balance within the artful grandeur of each song’s composition, the massively meticulous orchestrations, and the full, expressive range of Hansi Kürsch’s inimitable voice. “With every release, we want to define ourselves on a new level,” asserts Kürsch. Musically, only those with a solid sense of self and an insatiable curiosity to discover new aspects of themselves can initiate journeys of exploration. After all the worlds Blind Guardian have taken us to since 1988, few would believe there are still new lands to discover in their music. Thankfully, At The Edge Of Time frees us all from the concept of “terra firma” and transports us into the dimension of time, where imagination knows no limits, where all worlds exist at once, and where all existence is drenched in song for all time. Check out the YouTube video below for samples from all of the tracks on At the Edge of Time.